Niacinamide creams are used as a morning or evening moisturizers for people who are looking to treat dry skin, reduce acne breakouts, and deal with aging skin. So, here is a look at some of the best Niacinamide cream reviews on today’s market. 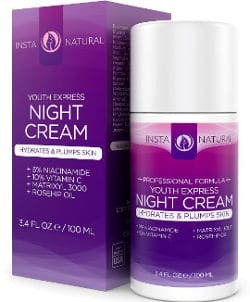 InstaNatural Night Cream comes in a 3.4 fluid ounce container with a pump. The company states that this moisturizer reduces deep wrinkles, dark spots, uneven skin and hyper pigmentation. It is a great moisturizing and anti aging solution and is also suitable not only for acne prone and sensitive skin but also scars and an irritated complexion. Apart from the Niacinamide, it contains other natural and organic ingredients such as vitamins C and E, aloe, argan oil and Rosehip oil. Also, it is worthwhile mentioning that there is an effective Peptide in this formula which is Matrixyl 3000. In addition, the product’s purchase is followed by a lifetime money back guarantee. Users really like this Niacinamide night cream and say that it is a non greasy formula that goes on smoothly, absorbs quickly and offers several skin benefits. They do state that it leaves their skin moisturized relieving dry and flaking skin. It also helps with wrinkles and fine lines, reduces dark spots and evens skin tone while brightening the overall look of their complexion. Several people not only reported that it prevents acne breakouts but it also minimizes signs of Rosacea, and there seems to be no irritation at all when using it. A little bit goes a long way so that this product is actually a good value. The Advanced Skin care Niacinamide Face Cream comes in a 2.0 ounce pump bottle and is actually a gel cream that contains some other high powered skin care ingredients such as Hyaluronic Acid, Emu oil, Bearberry Extract, Wrinkle blur and Sea Kelp. It is made in the USA which will make it more attractive to some people. Users like this product and give it very good ratings and reviews. Some of them actually find it more hydrating than hyaluronic acid serums and state that it absorbs quickly and does wonders for their skin. It reduces fine lines and wrinkles, lightens their overall complexion, lessens dark spots, tightens skin and minimizes acne breakouts. It has even helped fade some old scars and light acne scars. Many people are surprised that it does brighten dull skin and make it so soft and smooth. This Niacinamide Gel Cream has become a favorite of many users who are actually surprised to experience such positive anti aging results. 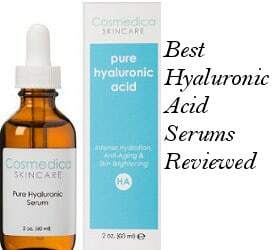 Here, I would like to comment that you might think that you have heard the previous statement a lot of times when looking for serums that are supposed to be good for anti aging, but, if you dig a bit deeper into reviews, you can see that in a lot of these serums, people report some benefits but they do not so overwhelmingly agree on the drastic reduction of wrinkles. In the case of this product, there are a lot of reviews that mention about wrinkle reduction without the customers having been offered a discount for their honest review. Finally, some users feel that the effects of this cream are noticeable within a few days while others mention that it takes up to 30 days to really begin noticing all the benefits of this skin cream. 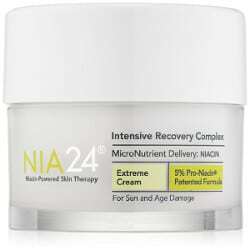 The Nia 24 Intensive Recovery Complex is a rich cream that comes in a 1.7 ounce container and contains 5% Niacin which is another name for Niacinamide or Vitamin B3. According to the company, this Pro-Niacin Cream is good for sun and age damaged skin. It moisturizes, nourishes and makes your skin stronger, fuller and firmer. It also repairs sun damage and improves texture and tone. It is suitable for both day and night use. Along with Niacin, this non comedogenic product also includes a peptide called Dermaxyl, Ceramides 2 and 3, Licorice root extract, Mango seed butter and others. It is free of fragrance, color and dyes but it should be noted that it contains parabens. Users find the Nia 24 Cream to work well at healing their skin and like the fact that it doesn’t feel greasy and absorbs easily. Several people have mentioned that it is best used at night. It has a nice texture and leaves their skin feeling softer and smoother. Users state that it reduces Rosacea breakouts and helps minimize many of the signs of aging. It evens their skin tone and brightens their complexion. Nevertheless, few users have said that this skin cream flakes off and others that they have experienced some breakouts after using it. The InstaNatural Vitamin C Moisturizer comes in a 3.4 ounce pump bottle and contains 20% of vitamin C, 5% of Niacinamide and another 5% of Hyaluronic Acid. Also, a peptide complex, plant stem cells, MSM and other natural and organic ingredients such as jojoba oil, vitamin E, aloe vera and green tea. The company claims that this natural Niacinamide cream is suitable for reducing fine lines and wrinkles, age spots, sun damaged skin, blotchiness and hyper pigmentation. This is a lightweight cream that is good for all types of skin of both men and women. It is free of parabens, alcohols or sulfates and created in small batches to ensure freshness. It is also offered with a lifetime money back guaranteee. Overall, it gets very good ratings and reviews. Most users really like this moisturizing cream and feel it does more than they expected it would. They state it goes on smoothly and is quickly absorbed. Users like its light texture and say that once it is applied, it doesn’t leave your skin feeling greasy. People with oily skin suggest that it suits their skin very well without clogging their pores. It also moisturizes nicely, reduces discolorations in the skin, even the skin tone, minimize fine lines and wrinkles and leave the complexion looking brighter. Nevertheless, there was a review of a woman in her late sixty’s that didn’t find this product moisturizing enough, but this can be the case with more mature types of skin which generally need some extra hydration and deep nourishment. If you are looking for a skin cream with a lower percentage of Niacinamide, then you might be interested in knowing that the Body Merry Vitamin C Moisturizer contains 2.5% Niacinamide. 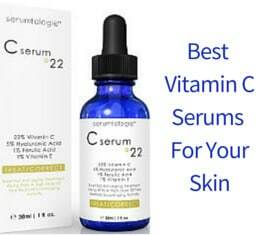 Also 22% of vitamin C, 20% of Hyaluronic Acid and 2.5% of Coenzyme Q10. This product is actually more of a light lotion than a cream and comes in a 1.7% fluid ounce pump. 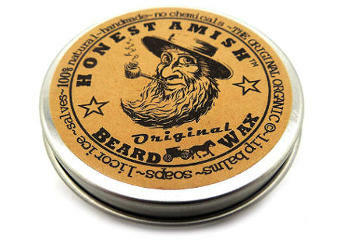 It is cruelty free and followed by a 90 day manufacturer guarantee. Although I wasn’t able to find its full list of ingredients, some of its other components are organic aloe vera, shea butter, jojoba oil and organic sunflower oil. The ratings and reviews for this moisturizer are very positive. Users mention that it goes on nicely and is fast absorbing. It also has a mild pleasant citrusy scent that quickly dissipates making this product a good choice for both men and women. People find that it is non-greasy, reduces wrinkles and results in plumper glowing skin. They like the fact that it evens out their skin tone and leaves their complexion feeling tighter. This lotion is long lasting and light weight making it ideal to wear during the day and able to wear under make-up. In conclusion, Niacinamide is a great ingredient to look for if you want to better control acne breakouts, moisturize well and reduce aging signs, so the reviews of the best Niacinamide creams we have been able to select can prove more than helpful.